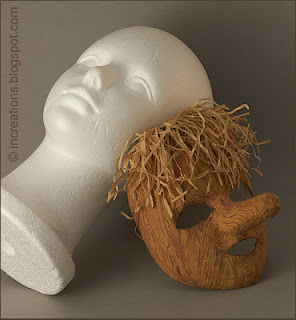 To make this papier mache Pinocchio mask, we used a polystyrene head as a mould for paper layers. Luckily for us, we've got one of just the right size to fit a three years old. Usually we build up two layers of small pieces of paper with water, then about three layers with dilute glue solution. Let dry between every 2-3 layers. It's better to use fine paper for the top layer to get smoother surface. After building the mask and letting it dry, we attached a long paper nose and covered everything with another layer of paper. Cut through eyes and mouth and glued small pieces of paper over their edges. Then painted the mask and glued some crinkled paper shavings for hair. For the nose, we built a mould of modelling dough and then used the same papier mache technique. About this technique: Layered papier mache. Such a joyful mask! My daughter would love to try it and play with it.